George Washington Sears; Writer, Naturalist and Man Known as "Nessmuk"
Sojourner is a history buff that shares stories about her ancestors and local history. She believes History is a fascinating journey. 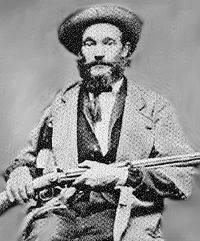 George Washington Sears was born December 2, 1821 in South Oxford, Massachusetts. He was the oldest child of 10. Like many children of the time, he was sent to the factory to work at the age of eight. He detested being inside and made his escape as soon as he was able. He was an avid outdoorsman and a conservationist that learned to survive in the wild from a Narragansett Indian named Nessmuk, The original Nessmuk lived in the Adirondack Mountains. The young Sears met the Indian and set about to learn all that Nessmuk had to teach him. George began his adventures at a very early age. He joined a whaling crew at the age of 12 and spent several years at sea traveling as far as the South Seas. Once he returned from his three-year stint he settled in Wellsboro Pennsylvania. When he gave up the sea, he was able to travel across American and it was during this period that he began to write in his journal the many experiences as well as the information that he learned. It was the information in his journal that would later become the Woodcraft and Camping book. Sears called these hikers "outers"
They would hire him to guide them as they hiked the Adirondack mountains. 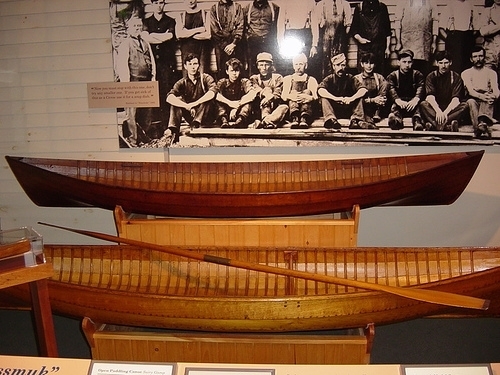 While he was relaxing in the evening after long canoe trips or hiking he would sketch and design more efficient canoes. To make the overland portion of the trip less grueling. Once the book was published it became the definitive guide and was placed in the backpacks of many new "outers" as the camping handbook. During the 1840' and 1850's Sears had been a guide to people that wanted to experience the Adirondack Mountains first hand. He would guide men on camping trips into the forests of the Adirondacks. While showing them how to survive in the wild he would take them on the lakes and rivers using his lightweight canoe. He believed in traveling lightly and had the motto, "go light, the lighter the better." With his treks through the mountains and his knowledge of canoe building he was able to take on the building and designing of an even lighter canoe. One that could be carried much easier than the canoes of the time. When hiking, the canoe was carried over the land between lakes. Canoes of the day weighed about one hundred pounds and "Nessmuk" was a small man. He was just over five feet and did not weight much over one hundred pounds himself. He needed a lighter weight canoe to maneuver through the forests on his own. That was when he started building them lighter and lighter. He was eventually able to create his own personal canoe the Sairy Gamp which only weighed about sixteen pounds. With all the time that was spent in the mountains, he became known as the expert on the subject of camping. Writing the book on camping, hunting, and hiking, he was able to influence a new way of looking at a trip into the Adirondack Mountains. The books still are being printed and sold. The information in these books is just as true today as when it was first written. I could have killed her, but I didn’t. 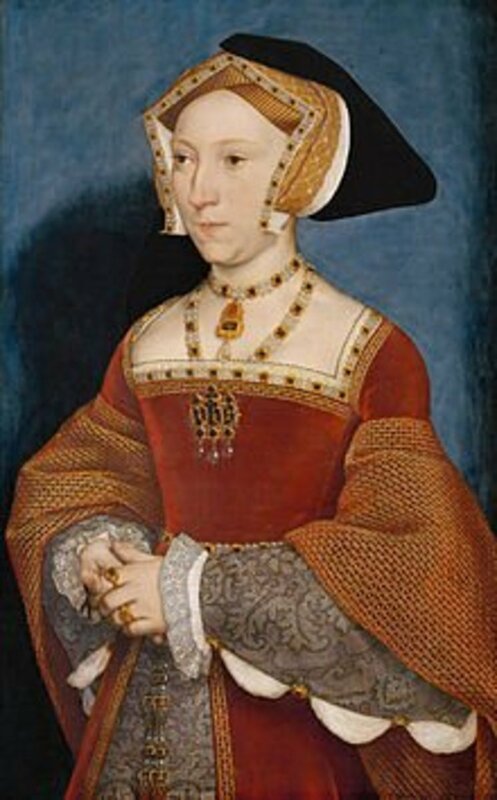 Though I was glad when she died, and assisted at her funeral with immense satisfaction. Junkamaug Lake is six miles long, with many bays, points, and islands, with dense thickets along its shores at the time of which I speak, and a plentiful stock of pickerel, perch and other fish. It was just the sort of country to delight the Indian mind; and here it was that a remnant of the Nepmug Indians had a reservation, while they also had a camp on the shores of Nepmug Pond, where they spent much time, loafing, fishing, making baskets, and setting snares for rabbits and grouse. They were a disreputable gang of dirty, copper-colored vagabonds, with little notion of responsibility or decency, and too lazy even to hunt. “…And I remain yours sincerely, Nessmuk, which means in the Narragansett tongue, or did mean, as long as there were any Narragansetts to give tongue, Wood-duck, or rather, Wood-drake. “Also, it was the name of the athletic young brave, who was wont to steal me away from home before I was five years old, and carry me around Nepmug and Junkamaug lakes, day after day, until I imbibed much of his woodcraft, all his love for forest life, and alas, much of his good-natured shiftlessness. “Gradually they came to understand that I was incorrigible, or, as a maiden aunt of the old school put it, ‘given over;’ and, so that I did not run away from school, I was allowed to ‘run with them dirty Injuns,’ as the aunt aforesaid expressed it. “But I did run away from school, and books of the dry sort, to study the great book of nature. Did I lose by it? I can not tell, even now. As the world goes, perhaps yes. No man can transcend his possibilities. “Poor Nessmuk! Poor Lo! Fifty years ago the remnant of that tribe numbered thirty-six, housed, fed and clothed by the state. The same number of Dutchmen, under the same conditions, would have over-run the state ere this. “The Indians have passed away forever; and, when I tried to find the resting place of my old friend, with the view of putting a plain stone above his grave, no one could point out the spot. In 1880 he wrote a series of articles for the magazine Forest and Stream Magazine . 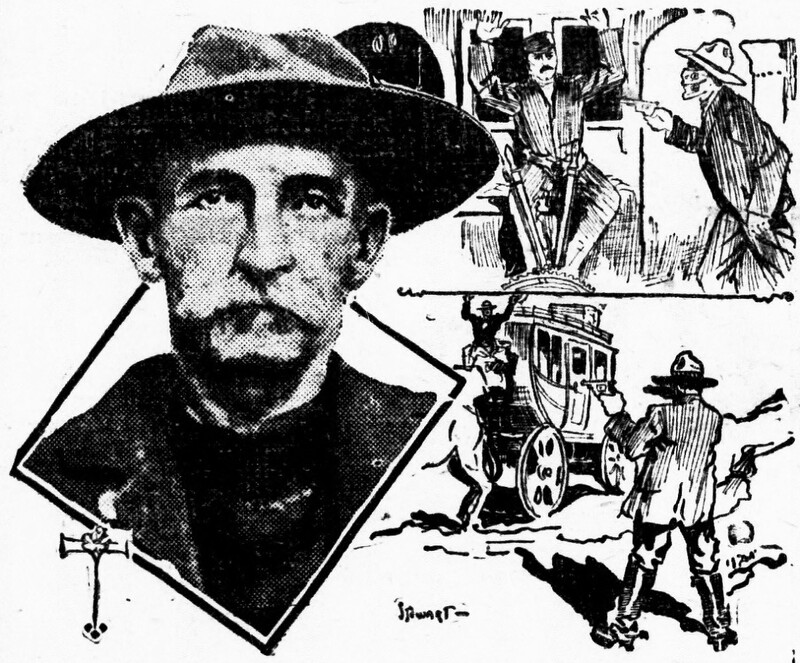 This magazine later became known as Field and Stream .He was best known for his trips taking the "outers" into the mountains and he described his trips and provided instruction and insight to future hikers. Sears had been all over by this point in his life, he had not only been a member of a whaling crew as a young man, he had been to the newly discovered areas of the Northwest. Sears guided many men into the depths of the mountains across the country. Sears had even been an editor of a Missouri Newspaper. By the time he was in his 60's and started writing for the magazine, he had a wealth of information and knowledge that the younger nature lovers wanted to hear An audience of inspired hunters, hikers and conservationists that would wait for his articles and follow his advice and instruction. For a man in his 60's to make these trips into the forest alone and travel the two hundred plus miles canoeing and carrying his boat across the terrain spoke volumes to the readers. Each trip took longer even though the canoes were becoming more compact. He writes about his adventures in eighteen articles for the magazine over the ten year period covering the three trips. 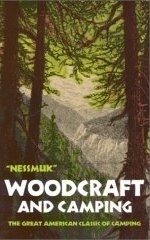 and they have been compiled into another book called The Adirondack Letters of George Washington Sears aka "Nessmuk" . 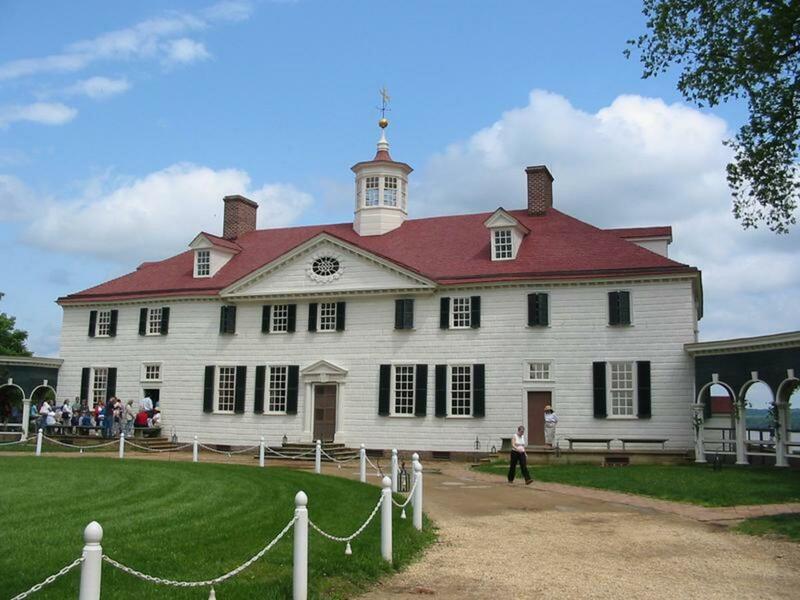 George Washington Sears was also a husband to Marietta Butler Sears and father to three children Jennie, Charles and Margaret. He spent so much of his life away from his family. He had one adventure after another and he spent the last ten years of his life reliving them in magazine articles and books. Sears also wrote poetry and verse while he was out on his adventures and these poems reflected his feelings and documented his travels and adventures. When he began to write, he used "Nessmuk" as his own pen name. The book of poetry, named “Forest Runes”, was originally printed in 1887. Woodcraft and Camping is a guide to the camper, hiker, and the hunter. A guide to making tents and making the forest safe by reminding the hunter never to point the gun at any other man while carrying it into the woods. A guide for everything from protecting your gear to reminders to tie all of your belongings carefully to the canoe so that if it were to tip, the contents do not sink to the bottom of the lake or float off. 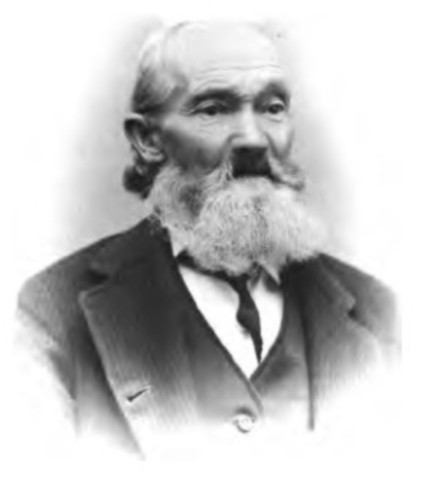 George Washington Sears "Nessmuk" died May 1, 1890 in Wellsboro, Pennsylvania. 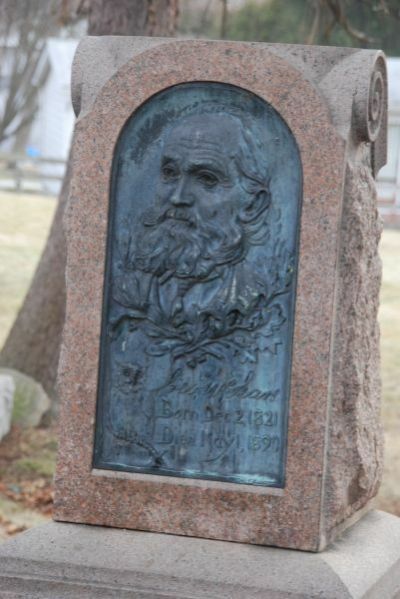 His grave is marked with a sculpture of his face and his signature on his tombstone. I know that Hollis is a name that some of my cousins also have. Phillip Hollis Dunning. Are you still in the Pennsylvania area? There are still some of his descendants around. He would have been my great uncle. Yes, have enjoyed reading about him. Thank you for reading about him. I had never heard of this. Thanks!